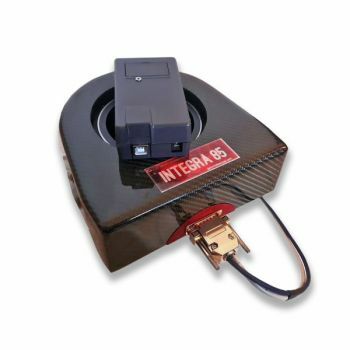 The Integra 85 is a focusing rotator. It has a clear aperture of 85 mm, a backfocus of 69 mm, and a travel of 10 mm. The focusing function of the Integra85 is based on 3 fine pitch leadscrews running in special low friction nuts that provide high loading capacity up to 8 kg with a travel of 10 mm in 188600 0.05 micron steps. The rotator is using a traditional wormwheel, the 360 degrees is divided up in 61802 steps. The focuser has an autocalibration feature. Abort Motion: Stop any focus motor movement. Sensors: Reading of the focuser temperature sensor. Max position: The focuser and rotator maximum travel in steps. Home at Center: This autocalibrates the focuser using a homing sensor and places the focuser in the center position at 94300 steps. The rotator position can be controlled via either setting the absolute ticks count or angle. To change the current absolute position to a new position without moving the rotator, use Sync to set the new desired position. Once Sync is set, the current absolute position shall report the synced ticks. Goto (Angle): Rotate to the specified angle. Abort Motion: Stop any rotator motor movement. Sync: Synchronise the current position as the specified angle. Goto (Ticks): Rotate to the specified tick count.